Due to the global warming, it is now pretty difficult to tell whether it is just a mild winter, an El Nino, or another polar vortex. However, one thing is certain. The winter season always heightens the heating costs, even when it is warmer than expected. Well, heating is a crucial part to any home that is not near the equator. Living in such cold climate, you need to make sure that the inside of your home stays warm and comfortable. To improve the warmth and comfort of your home, you can install a baseboard heater. Baseboard heaters are great as a secondary heat source, in addition to the primary HVAC system that may have been installed in your home. You can also use baseboard heaters for peripheral spaces, such as the basement or cabin. However, there are two types of baseboard heaters in general: hydronic and electric. So, what are the differences between hydronic and electric baseboard heaters? Which is the one better? See the comparisons below. 1 What is a Hydronic Baseboard Heater? 2 What is an Electric Baseboard Heater? What is a Hydronic Baseboard Heater? Well, a hydronic baseboard heater is a heater that produces rays of heat. The heat is acquired from boiling water. Thus, it is designed to connect with a boiler. The boiler works to boil water. The heat of the boiling water is then transferred to the heater system to heat the air. The heated air is, afterward, released into the room. There are various models available. Some models are equipped with electric boilers. An electric boiler plugs into a power outlet and uses electricity to heat and boil the water into water vapor. However, there are also more traditional boilers that heat up by burning wood pellets. There are also some self-contained models; these hydronic baseboard heaters have built-in boilers and are usually powered by electricity. On the other hand, an electric baseboard heater produces heat in waves. It purely uses electricity to power the heating system. You are probably familiar with convection ovens; just like convection ovens, electric baseboard heaters rely on convection to transfer heat to the air. 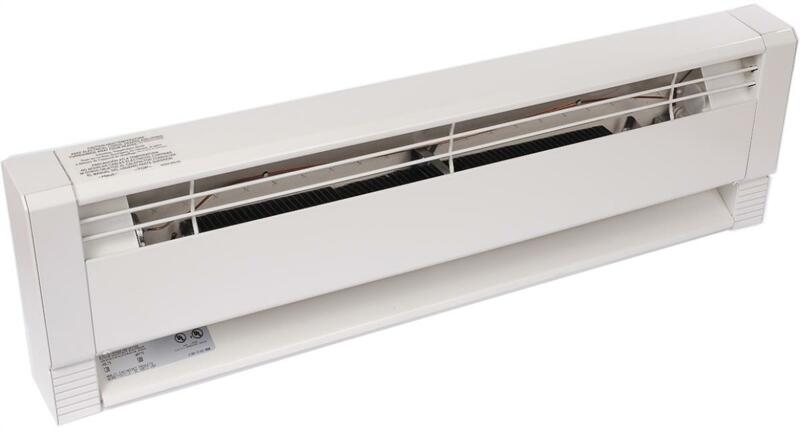 An electric baseboard heater has a fan that circulates heat around the cavity, heating the air, which is then released into the room. In general, hydronic baseboard heaters are more expensive than electric baseboard heaters. This is because hydronic baseboard heaters have more complex components compared to electric baseboard heaters. You see, the hydronic models require boilers. The electric models don’t need such boilers. For the same reason, the labor costs of installing a hydronic baseboard heater are usually also more expensive than an electric baseboard heater. Installing a hydronic system is more difficult. There are more components to put, and you have to make sure that the connections are properly sealed. Otherwise, the water may leak everywhere. Water leakage is extremely dangerous; not only it can cause structural damage and mold growth, but also it can cause a fire hazard if the leaked water contacts electricity. If you don’t know what you are doing, make sure that you get a professional help for the installation. Electric baseboard heaters are relatively easier to install, though you may also need a professional help if you need to make a hard wiring to the electrical line. Although hydronic baseboard heaters are usually more expensive than electric baseboard heaters up-front, in the long run, they may actually be more affordable. This is especially true for those models that work with traditional boilers using wood pellets. But electric boilers are also energy efficient, in comparison with electric baseboard heaters. It goes without saying that a traditional boiler will not consume electricity – a plus point if you want to save some bucks in the long run. Water retains heat better, allowing the system to work more efficiently. So, your electricity bills will not be increased very much during the winter. Hydronic baseboard heaters take a longer time to heat up. So, if you have just turned on the system, you may need to wait for an hour or two until you can feel the warmth. On the good side, hydronic baseboard heaters also provide longer lasting heat. This is the main reason why many people prefer hydronic baseboard heaters. Even after the thermostat goes off, the water in the boiler will remain warm for a long time. So, you won’t have to turn on the heater all day long. Electric baseboard heaters, on the other hand, are faster to heat. They can make your room warm more quickly. However, the faster it comes, the faster it goes. Electric baseboard heaters will not make your room warm for very long. Once it is turned off, you will start losing the heat quickly. So, in the winter days, you may need to turn on the electric baseboard heaters for a long time. Nevertheless, when it comes to size options, electric baseboard heaters seem to provide the greatest collection. It is available in various sizes, from the short ones to the long ones. Meanwhile, the size options of hydronic baseboard heaters are rather limited. There are just few models and brands that have long (72” or 96”) hydronic baseboard heaters. You need to consider how large your room is and how long that you need the heater to be. Baseboard heaters are great to keep your floor and home warm in the winter. Hydronic baseboard heaters rely on the water in their boilers to produce heat. They are more expensive and more difficult to install, but they are more energy efficient and also produce more long lasting warmth. On the other hand, electric baseboard heaters are cheaper and available in more sizes, but are less energy efficient and won’t produce long lasting heat once. In general, hydronic baseboard heaters are better for rooms that are often occupied. You can use electric baseboard heaters for peripheral spaces, such as the basement or cabin, that are not always occupied.